One of South Africa’s most accomplished trail runners recently left our shores to become a full time athlete, journeying around the world and exploring it through its trails. 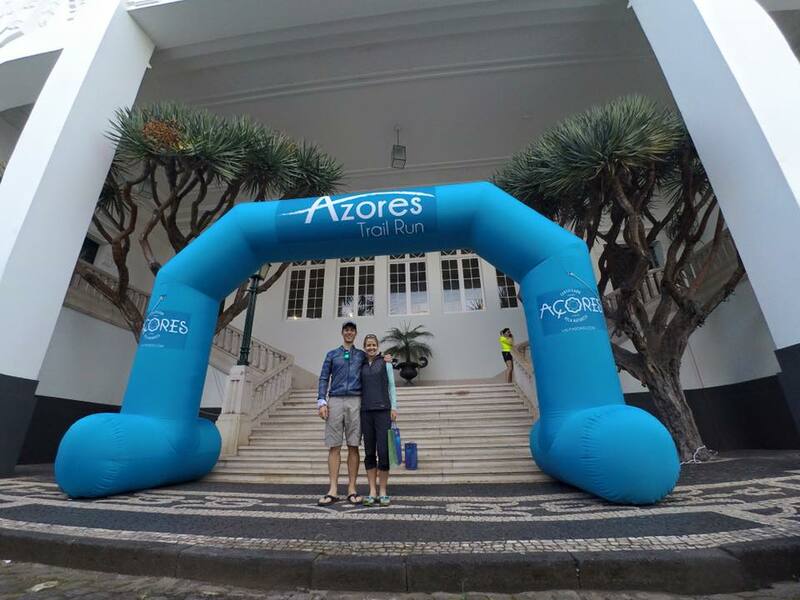 His first stop was Azores, where he took part in two events. This is his account of the experience. Written by Christiaan Greyling. Azores is one of the two autonomous regions of Portugal, an archipelago composed of nine volcanic islands in the North Atlantic Ocean about 1,360 km (850 mi) west of continental Portugal, about 1,643 km (1,021 mi) west of Lisbon, in continental Portugal, about 1,507 km (936 mi) from the African coast, and about 1,925 km (1,196 mi) southeast of Newfoundland, Canada. What did we expect and what did we experience? 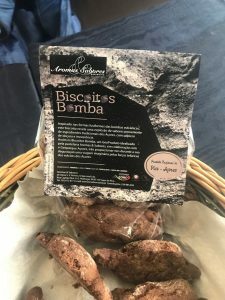 Whenever one travels to a place where you have never been before, you have certain expectations of the place, the race, the people and often times you are pleasantly surprised by what you get. 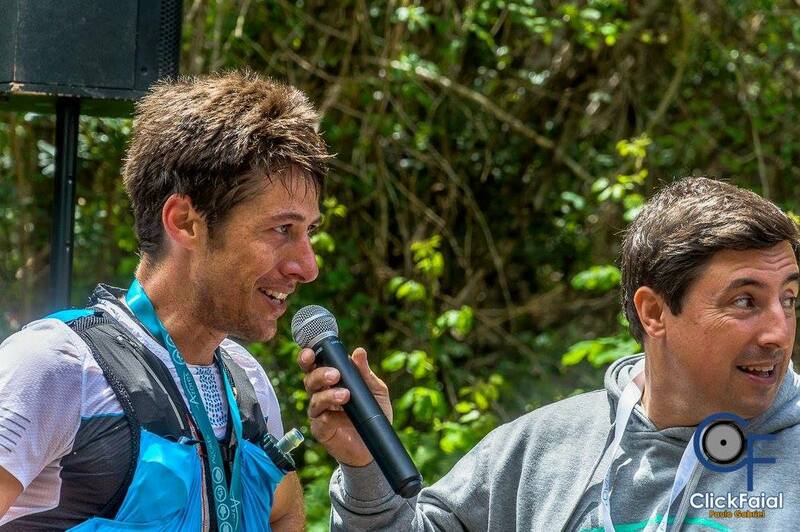 When we arrived at the tiny airport we were greeted by the friendliest people from Azores trail team. This friendly vibe seems to be common to the island and very contagious. They speak fluent English and the Portuguese were soft on our foreign ears as well. I had totally underestimated the race technicality and in the first 4km realised I chose the incorrect shoes for this muddy course. 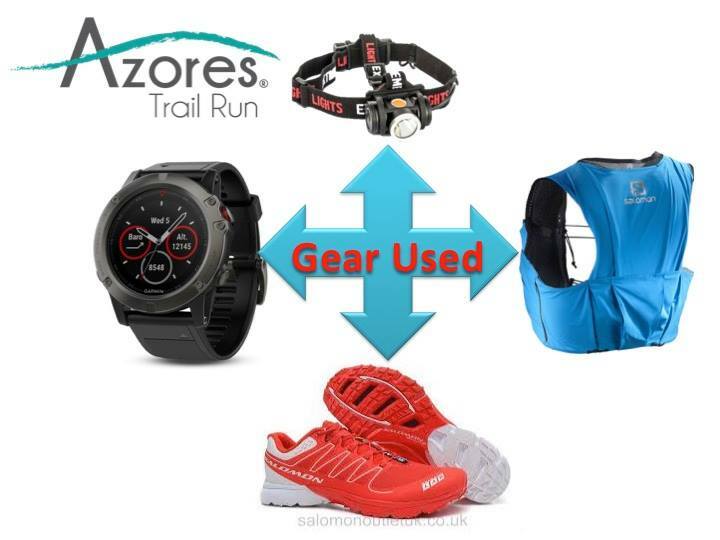 My prefered choice for marathon and shorter distance is the Salomon Sense HG for its light weight. 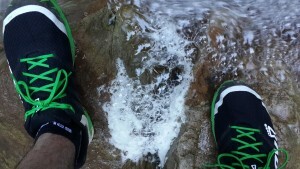 My preferred choice shoe for Ultra’s and muddy terrain is the Salomon Sense SG (Soft Ground). Vertical KM is quite a known concept in European racing where you ascend 1,000 vertical metres in the shortest distance possible (usually less than 5km). 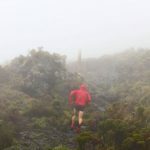 The Azores Vertical km takes one up the side of a Volcano in a mere 3.5km giving it one of the steepest ascents on the Skyrunning World series calendar. The VK took place on the island of Pico. The landscape features an eponymous volcano, Ponta do Pico, which is the highest mountain in Portugal, the Azores, and the highest elevation of the Mid-Atlantic Ridge. We were transported by ferry to the other island and then by bus to the start of the race. The weather was extreme! To explain the conditions in writing would not do justice to what we experienced, but all I can say is that at least 2 people almost lost their lives due to hypothermia. This once again should be a life lesson to any trail athlete. No matter how fast, how confident you are, mother nature is not your friend to play with. Always take your compulsory gear, and if you love your life, take more than needed. Due to the extreme weather, the route was changed to a 700m ascent. Thank goodness! 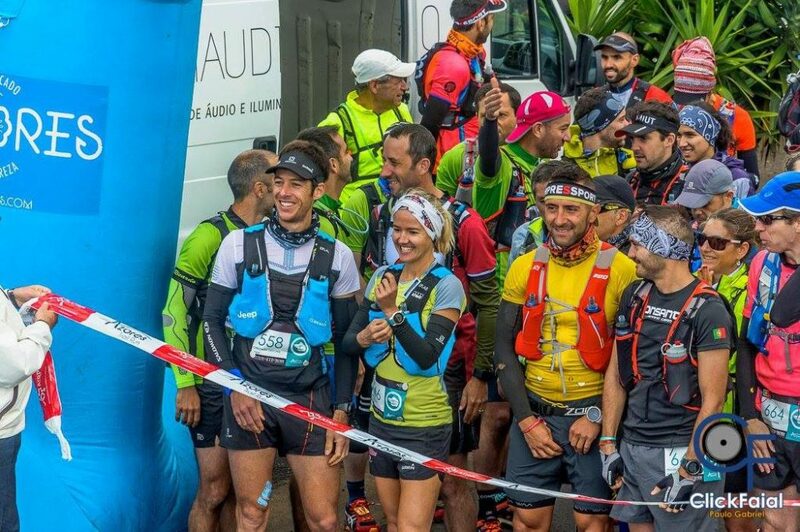 I did not know how to race a VK, and because you start 30 seconds apart you have little idea of your competition and thus the general rule is, go as hard as you can and if in doubt, go up! 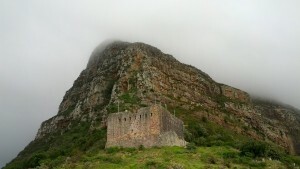 I enjoyed the crazy weather, as I have never before experienced wind and rain to that extent. 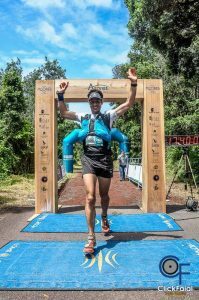 I completed the 700m ascent in 33 minutes and was surprised to see that I was only 1 minute behind Tsubasa Fuji (Superstar Fuji) to place second. 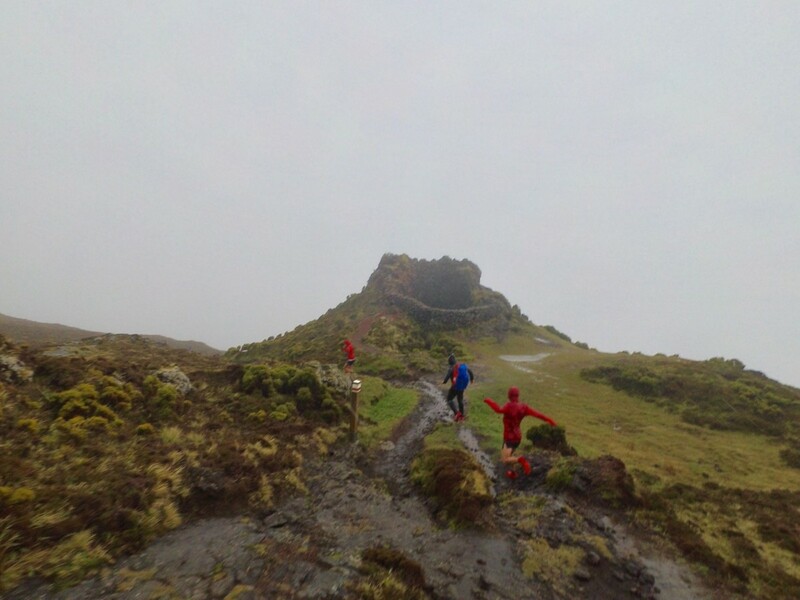 This trail takes us into the time of the island’s formation, passing by volcanic cones and chimneys, craters and caves, mysterious and characteristic places of the beautiful Azorean volcanic landscapes. 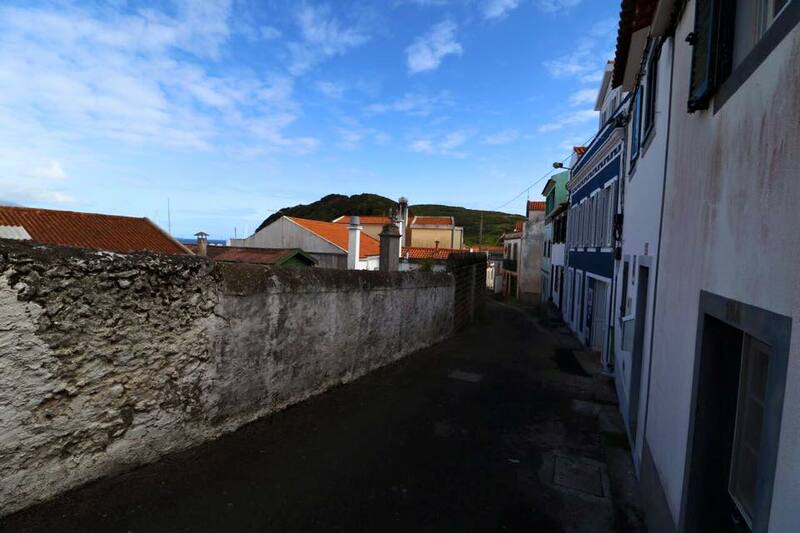 It starts at Porto da Boca da Ribeira, at 0 meters of altitude, in the parish of Ribeirinha, the oldest and most eastern point of the island. 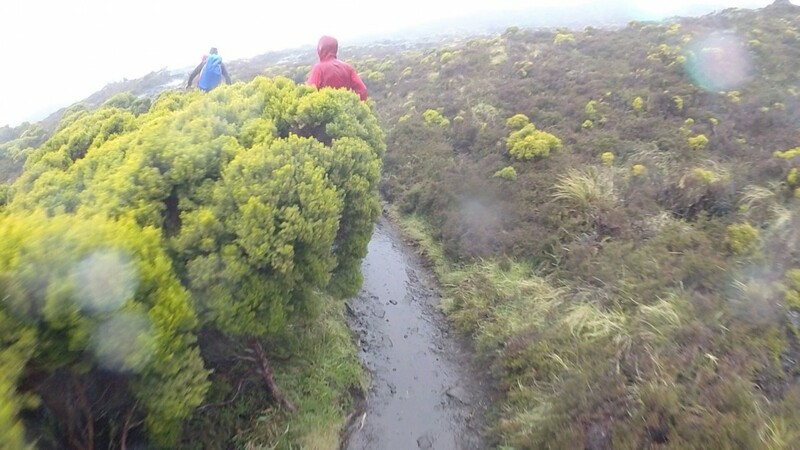 In fact, the trail runs on one of the transversal faults of the great submarine ridge, located towards the West of Faial – the Mid-Atlantic Ridge – a true scar in the middle of the Atlantic Ocean. It resulted from the last great continental separation and oceanic expansion that began 300 million years ago, along which volcanoes got installed, forming islands at the surface. 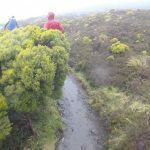 The trail reaches an altitude of 1000m, passing by old paths and by Faial’s Caldera, the crater of a dormant volcano with a diameter of 2 km and a depth of 400m. It originated about 500 000 years ago and the successive eruptive phases built the central zone of Faial, named as Cedros Volcanic Complex. The unique characteristics resulting from the island’s young age make this trail that crosses the island from the Eastern coast to the Western coast even more attractive. You pass by luxuriant landscapes typical of these islands, until you reach the authentic moon desert of Capelinhos Volcano landscape, frequently called “the last volcano of the line” for it is the most recent element of a fissural volcanism that produces an authentic alignment of cones. This process was initiated 15 000 years ago and ends at Capelinhos Volcano that resulted from the eruption of 1957/58. This volcano was responsible for the emission of 175 000 000m3 of ashes, forming the present Capelo’s Volcanic Complex, Europe’s most recent volcanic peninsula. 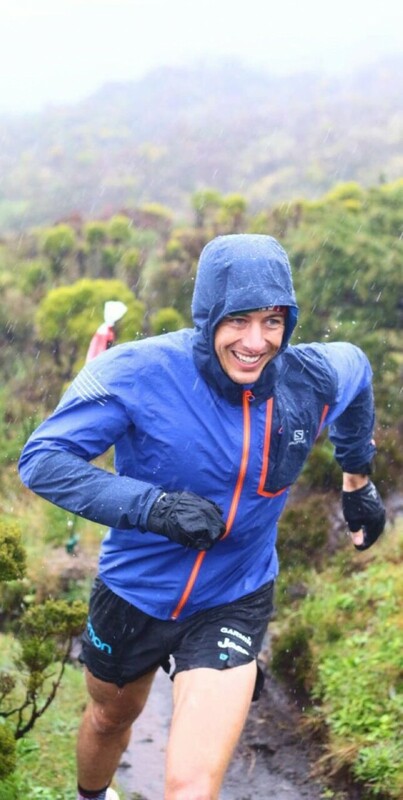 To me this race was significant on the calendar as it marked my first race as a full-time athlete. 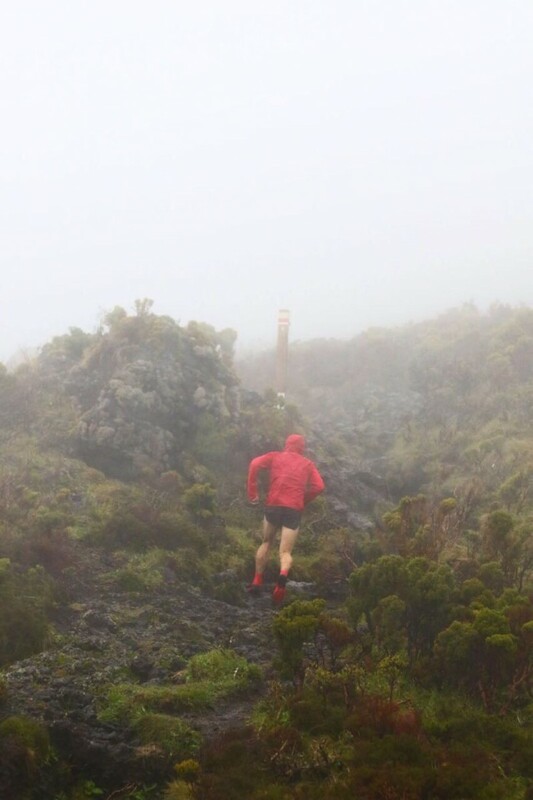 What was also interesting was to run on new land, a recently formed land mass caused by the 1957 Volcanic action. 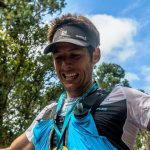 That section of the course looked like Mars, while the rest of the course was lush green with giant ferns and water streams all over the route. When you compete against athletes unknown to you, you have to adjust and play it by the day. 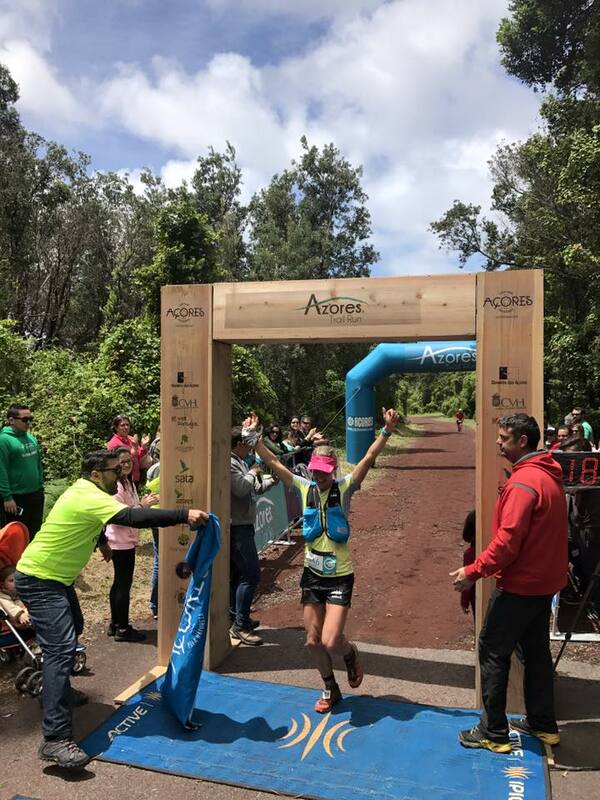 We started off in a group of about 5 athletes towards the front and had a comfortable pace on the perfectly planned course on the volcanic line of Faial. At about 9km one of the athletes made a break and I copied his move. 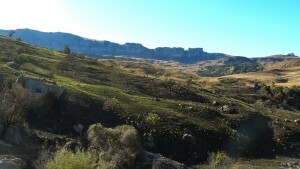 I kept contact with him until 17km where I went off course to fill up with water at the waterpoint. This is where we entered the Caldera, better known as a crater. The race organiser warned us about strong winds, but again my expectations underestimated the extent of this comment. The wind was so extreme it could blow you off your feet! I saw some of the 20km runners on hands and knees crawling the 1km of trail on the Caldera’s edge. This was an incredible experience and one to always remember when the weather is tough on raceday! In these extreme conditions and poor visibility, I lost sight of my competitor. 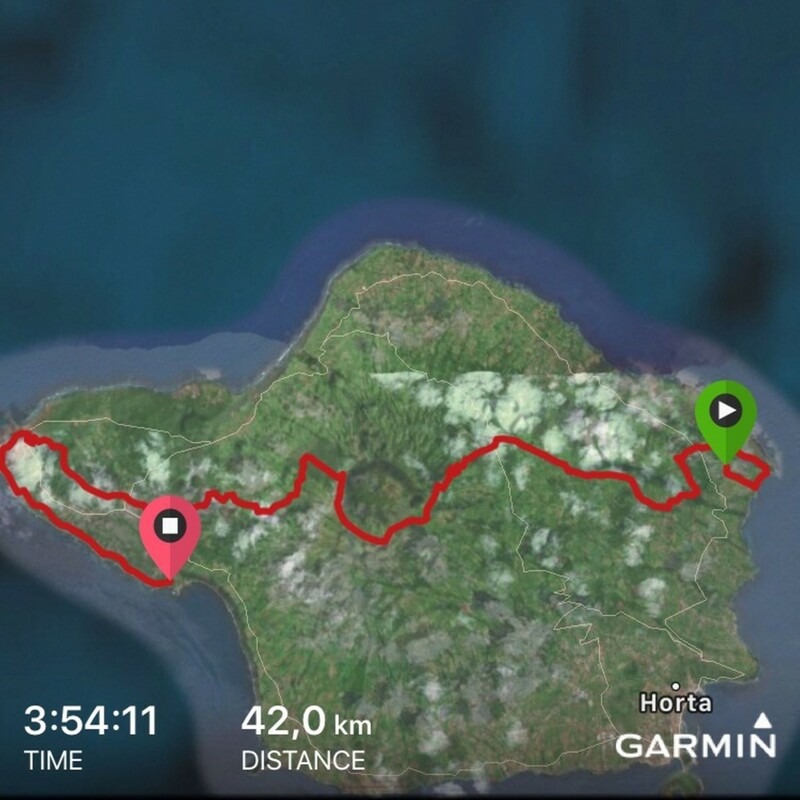 I gave it my everything on the muddy downhills to try to catch up with Dario again, and it took me another 17km before I caught sight of him again on the last climb. I sprinted past, and I knew it is race on for the last 7km. This time I ran past the waterpoint as I realised another stop would be the difference between a win and 2nd. Somehow I managed to open an 8min gap on him in the last 7km and finished the 42km, 2000m ascent in a time of 3:54, certainly one of my best trail marathons with this elevation and those weather conditions. Once again I appreciated what an event like Azores trail means to runners. 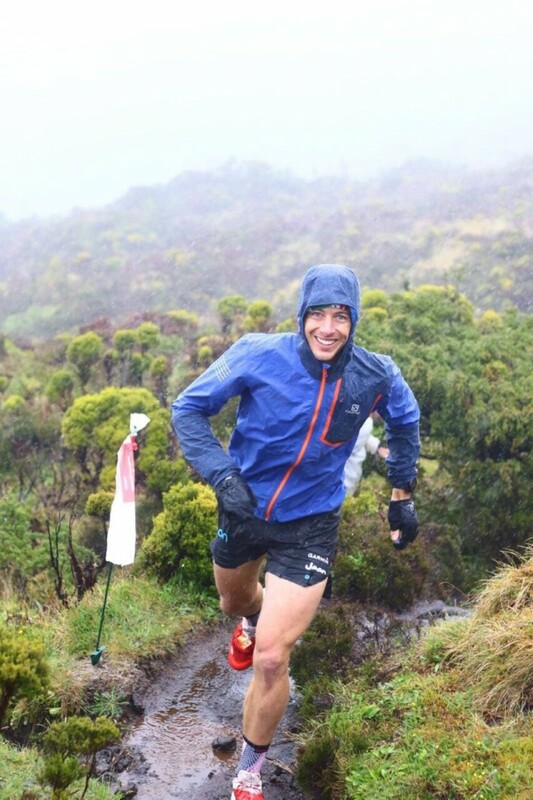 We come to this race to test our best gear against the extremities of the weather’s menu, we crossed the globe to experience something we’ve never experienced before, we make new friends, but most of all we come to do soul searching in the remoteness of the mountains. 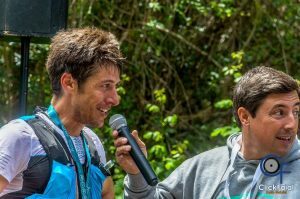 I take my hat off to the following people whom deserves huge respect: Azores trail for organising this event fluently and effectively. The island community, for their involvement, land and voluntary support. To my wife Landie Greyling, being a super coach, travel partner and world-class athlete. To my strength coach Ronel Nattrass, and training group Vicky van der Merwe who assist me to achieve the best of my abilities. 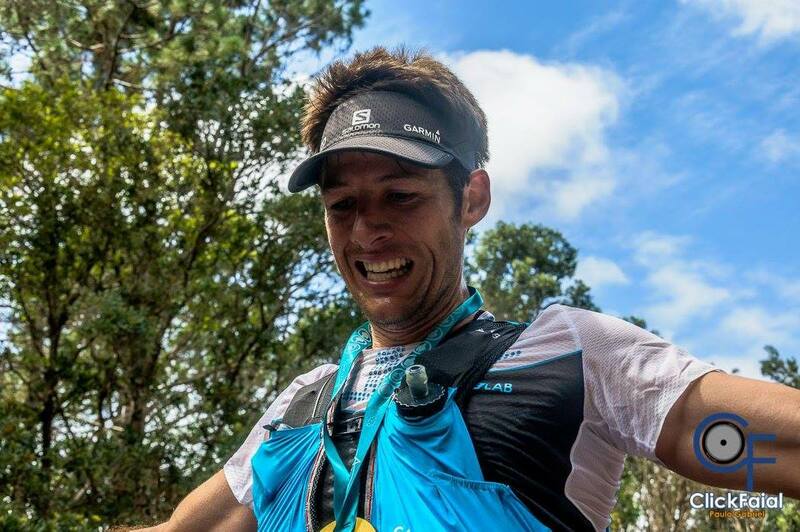 To my partners; Salomon, Garmin, JeepTeamSA, FormFunc & Humanscale, Extreme lights and Activepatch4u for providing me with the best gear to withstand the challenging conditions. Thank you to my nutrition sponsors, Nuun hydration and, IamSuperbar for sustained healthy energy. I am blessed and humbled by the number of messages I’ve received during the race of family and friends tracking and praying me all the way to the finish.